Video4aDay is an award winning Video Production Service that specialises in professional, stylishly filmed wedding videos, offering couples a unique and innovative way of documenting their special day. 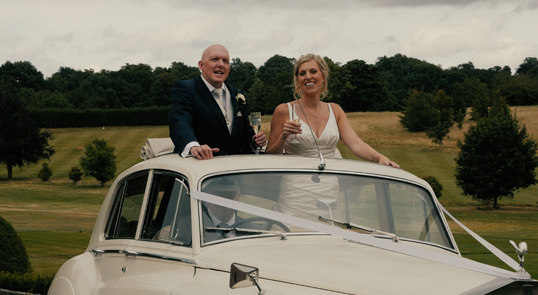 Shooting on Professional Cameras and operating across Surrey, Hampshire and Sussex, Video4aDay has been filming those once-in-a-lifetime moments with a creative, discreet style designed to capture the spontaneity and the emotion present on the big day. Beautifully edited to enhance the emotion and themes of the day. We can not recommend Steve highly enough! The videos we have received have been breathtaking and my family, friends and I have enjoyed watching them (on repeat!). Many guests didn’t even realise Steve was there for our big day, showing how he doesn’t intrude on your day but catches all the right moments, and parts of the day you didn’t see! he has been so easy to communicate with and always very helpful. We can’t thank Steve enough for capturing our special day, and he is worth every single penny. It’s a big decision to choose a videographer for the day, and I definitely made the best one! Thank you again for all of your hard work. Steve was the videographer for our wedding last Saturday- and yesterday we received our two min trailer- which is totally amazing!! It brought me (and lots of our guests) to tears, laughter and goosebumps. We nearly didnt book a videographer but our lovely friends Scott and Holly Mitchell used you the previous Summer and said how much they loved the video and it was worth every penny. So we found the budget for it and booked Steve. Could’nt be happier with the way him and the cameras just blended in on the day and the way Steve perfectly captured the day for us. Literally bursting to see the full version in 6 weeks time! Thanks for everything Steve- was a day to remember forever!